Merry Christmas and Happy New Year to you all. I'll be blogging very infrequently during the holidays, so enjoy the skies, keep an eye on Mars and see you in the New Year. The 34th Carnival of Space is up at Spaceflight. Its got "best of year" roundups, spacecraft and astounding photos. Hop over there now! UK astronomy is in a parlous state, with swingeing cuts to their funding bodies (25%!! how can a civilized nation do this?) and planned withdrawal from several important telescope collaborations. Stuart has the full story and links to Save Astronomy, a website where you can help efforts to get astronomy back to health in the UK. DaveP has the story too, and lots of helpful links. The Bad Astronomer is on the case as well. Go over to Save Astronomy now and register your support. I can't believe this. As a space nerd, and a longtime fan of Woomera, I missed out on the 40th anniversary of the launch of Wresat, Australia's first Satellite. Growing up as a space obsessed kid in 1960's Australia I luxuriated in the warm glow of knowing Australia had it's own space launch site. True, most of those launches were sub-orbital sounding flights, but we launched actual rockets to the very edge of space (and the occasional satellite, sometimes they didn't blow up). In 1967 a redstone rocket booster was donated by the Americans, and a team form the Weapons Research Establishment (WRE) and the Physics Department at Adelaide University planed, built and launched Wresat in 11 months. Ironically, my colleague John Carver's father, (also John Carver) was one of the leaders of the satellite team. You can read a longer article about the satellite development and launch here. The satellite collected data on the upper atmosphere and worked for 73 orbits before the battery failed. So what do I remember about this amazing feat of planning and engineering, leading to Australia being one of the few satellite capable countries, a mere two years before humans walked on the Moon. Nothing, absolutely nothing. I'm sure I would have remembered if it had turned up in the newspaper (we didn't have TV in our house then), or on the radio. It might have been feted in the Southern States, but I'm pretty sure no news made it's way up to QLD. The 40th anniversary also passed unnoticed by the ABC or major Australian new outlets. I find it very sad that Australia's space achievements are so undervalued. Image from the JPL Space Simulator. 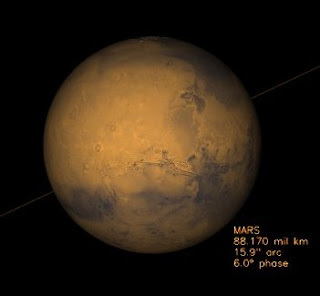 Mars is at opposition on December 25th (a nice Christmas present eh?). However, Mars is at its closest tonight. Of course, here it is all cloud, cloud, cloud. 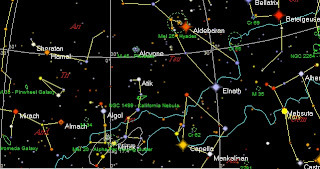 For more details on the opposition of Mars, including maps, observing hints and links to images, see my Mars Opposition page. See the subtitle of this blog. Get it? So in place of a Geminid report I give you an image of the Moon and Jupiter reflected in a pool (click to enlarge). Enjoy. At least some people saw some decent Geminids. There is a Geminid Gallery over at Spaceweather. Australian observers have been recoridng variable success over at IceInSPace (here and here). Some have had good rates, other very poor (typically at latitudes south of Sydney). Oh well, there will be other years. This weekend the Couch Potatoes of Chez Reynella headed of the the "Dinostory" sand sculpture at Port Adelaide. There was a guided tour (very interesting and informative, though I seethed to learn of the vandal attack on the scuplures a week ago) , a "dino dig" (a bit cheesy that one) and a workshop on making sand sculpture. The workshop was pretty good, and you got to play with sand and with professional tools. The sculpture just above is MiddleOnes Sea Serpent chasing a fish. All in all a very nice way to spend the day. Don't forget the Geminids Saturday Morning. This Saturday morning we will have the best of the Geminid meteor shower. You have to get up after 1:00 am and look north, but it will be so worth it. Of course, it is finally raining here. I do a weekly sky update for the ABC, it's in a rather dry "only the facts Ma'm" style. Someone has tried to spice it up a bit. Here's the "improved" version for a bit of a chcukle as you watch the sky. finish to a night of meteor and two guys in the shower watching. The 33rd Carnival of Space is now up at the Universe Today. Van Allen Belts, the Shuttle, its Orion replacement, the Geminids, magnetic sail spacecraft, anelemas and a whole lot more. Pop over now and have a read. Run, don't walk, over to the Bad Astronomer's blog, where you can see his top ten astronomy images for 2007. They are absolutely stunning. Image Credit NASA/JPL/Space Science Institute. Science literacy has occupied my mind much lately. In a complex world where much of what we do is influenced by science, and in democracies where people are expected to have some form of input into issues as diverse as stem cell therapy and global warming, science literacy is of utmost importance. By Science literacy I don’t mean just the ability to reel of a list of scientific facts, but a broad appreciation of how science works, how we build up scientific knowledge and an understanding of how to find facts and try and understand their context. This was brought home to me by two things this week, the report that Pan and Atlas, Moons of Saturn, are shaped like disks, and a truly awful Creationist video about the Universe and the solar system. There is only one thing to say about that video. “The Stupid, it Burns!” The fact that I saw it on the same day as I saw the latest evidence for our leading model of ring formation is sheer irony. I dearly love astronomy and space science, and I hate seeing it violated in this way, but sadly, there is just so much nonsense in that video that I would be here until Christmas writing about it’s gross errors. But I will take one statement from the video and use it to illustrate a little of what I mean about science literacy. "Scientists have no answer for why some planets have rings." First things first. There is a logical leap here which should be pretty obvious (well apart from the fact that there is no reason at all why evolutionary biology, which explains the origins of diversity of biological organisms, should have anything to do with star and planet formation). The fact that scientists cannot currently explain a phenomenon does not mean we will never be able to explain a phenomenon. Science is not a list of established facts, but a dynamic process of investigating the natural world (the number of newspaper articles which start “Scientists have just discovered …” should be a clue to almost everyone that scientists don’t sit around doling out established facts. 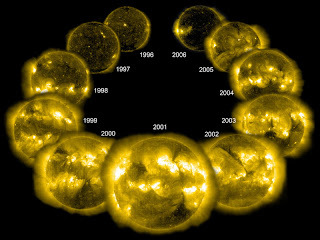 Scientists investigate things, for centuries no one had a clue how the Sun worked, but then we worked out atomic fusion. Well, that’s the logic bit over. Scientists once thought that the rings were formed at the same time, as the planets when they coalescing out of swirling clouds of interstellar gas 4.8 billion years ago. Under this model, remnants of material within the Roche limit could not condense and would become rings. However, in recent years this idea seems to be flawed. The rings appear to be young, perhaps only hundreds of millions of years old. One of the clues to this theory is that the rings are bright. As Saturn travels though space, the rings accumulate dust particles that have been darkened from solar radiation. If the rings were old, they should appear dark. Another theory suggests that perhaps a comet few too close to Saturn and tidal forces broke it into pieces similar to comet Shoemaker-Levy/9. Perhaps one of Saturn's moons was struck by an asteroid smashing it into the bits and pieces that form the rings. Hopefully the Cassini spacecraft can answer some of these questions. So we can see that there are at least three possible explanations for the existence of the rings, one of which appears to be unlikely based on evidence. So much for “Scientists have no explanation”. Lets look at the second hit, from Berkley, it’s a problem set based around the idea of tidal disruption (Tidal disruption seems to be ruled out). Hang on, what’s going on here, we have three explanations, and two of those don’t seem to be supported? Oh No! We are testing our ideas with evidence! Nine Planets (hit number 3) doesn’t give any more evidence than the first two sites. The next hit is an academic abstract, the next is what appears to be a kook site, and then a kids site. So, after a page of pages (sorry), we haven’t learned to much about Saturns rings origins, except that the creationist claim is obviously wrong (“origin Saturn’s rings” gets you into some real data sooner, at hits 5, 6 and 8 making sure you have the right search sting is critical to searching, also try Wikipedia). Hit 11 on the “formation Saturn’s Rings” search comes up with the flying saucer Moons (pictured above). As well as being seriously cool, these Moons give some insight into ring formation (although you won’t know it from the above article, see this one for how the shapes of the Moon’s support the shattered moonlet theory, see also here, and here from the “origin Saturn’s rings” search. After your search, you will be somewhat dazed and confused. However, even the most science illiterate person will realize that the statement “Scientists have no answer for why some planets have rings” is wrong. Assembling the fragments you get from the search into a coherent picture is harder. If you only base your knowledge on the web searches, you may not develop a sense of our understanding of the formation of the rings, but seem to be confronted with a series of disconnected facts. Getting the sense that our leading theory is the "Shattered Moonlet" theory, and that the Pan and Atlas images support that theory is much harder. Learning how to synthesise these apparent disparate facts into a clearer picture is the role for science literacy. Heck, even learning that you need to do searches under different search strings and read more than one or two web sites (and how to recognize untrustworthy websites) is part of science literacy. How do we achieve this? Well, that’s another post for another day. Chart of the northern horizon as seen from the southern Hemisphere around 1:00 am local daylight saving time. The astronomical event this week is the Geminid meteor shower visible on the mornings of Friday 14 Dec and Saturday 15 Dec. The Geminids are a fairly reliable meteor shower, with rates of about a meteor per minute, the debris from the asteroid 3200 Phaethon. However, the radiant doesn't rise until just before midnight (daylight saving time) in most of Australia, so you will still have to disturb your sleep for this one. The shower is in a beautiful part of the sky however, with Mars just above, Orion above that and the Pleiades nearby so you won't mind really. 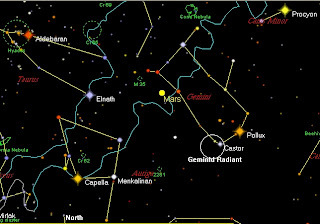 At 1.00 am in the morning AEDST (midnight, AEST) Castor (alpha Geminorum) is about two hand spans above the horizon and 10 hand spans to the left of due north. Pollux, the other twin, is less than a hand span to the left again. The radiant is just below Pollux. Unlike the Leonids, where there is a very narrow peak of high activity, the Geminids have a broad peak and will show good activity well before and after the peak, and on the day before and after. The peak is predicted to be around early evening on the 14th, before the radiant rises. So the best time is the morning of Saturday 15th, any time between 1:00 am and twilight. The moring of Friday will be pretty good too. A printable spotters map is here. Solar Minimum has persisted for a while, and the Sun has been free of any substantial sunspots (or any sunspots at all) for quite a while. However, this has changed with the appearance of Sunspot 978. Actually its a complex of Sunspots, covering around 6 times the area of the Earth. The image to the left shows Sunspot group near the middle left hand edge. I tried viewing this sunspot directly with solar film, and using binocular projection, but I couldn't make it out. Family duties (including destroying our TV reception while trying to fix it [don't ask]) prevented me from setting up the telescope, but I might have a go tomorrow. As for the C3 image next to the Sunspot image. Wondering where Mercury has been lately? It's the bright "star" on the middle of the right hand side of the image. The next brightest dot near the bottom right of the image is Antares. This video (from SOHO archives)Shows a nice solar flare as Mercury heads in towards the Sun, while Antares heads out. Venus, the Moon and Spica on the morning of December 6th. Naturally, Spica is the faint dot to the left of the Moon, and Venus the bright one down the bottom. Click on the images to enlarge them. The 32nd Carnival of Space is over at Robot Guy. There's spacey murals, a visit to the museum (the American Museum of Natural History), lots more Moon stuff (and the controversy over the Chinese Moon Photo's), Mars exploration, Jupiter and more. So mosey on over and say Hi! to Bender. If you would like to nominate a post for Carnival of Space, the instructions are here. 12 years ago on December 2 the Solar and Heliospheric Observatory (SOHO) was launched. SOHO has observed nearly a full Solar Cycle, as this dramatic image released yesterday shows (it's also up on Astronomy Picture of the Day). A multitalented spacecraft, when not observing the Sun in multiple wavelengths, and Coronal Mass Ejections, SOHO has picked up several comets. Happy Anniversary SOHO! Lets hope it runs for many more years! The eastern horizon an hour before Sunrise, as seen from Australia. 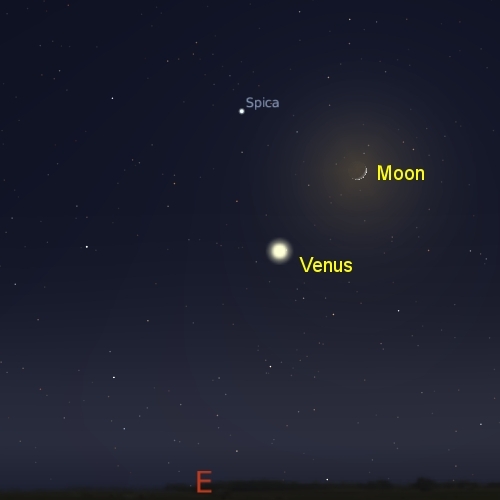 On the morning of Thursday December 6 the crescent Moon, Venus and the bright star Spica form an attractive triangle in the twilight sky. If you are up early that morning, have a look, it would even be worth getting up early anyway. I saw an unexpected fireworks display. I have no idea what it was for, but it made for a pleasant few minutes watching pretty coloured lights, not that Jupiter is too low on the horizon for decent viewing. Comet 17P Holmes is still visible to the unaided eye! This is over a month since it’s unexpected outburst! Now that the full Moon is out of the way and the comet is further from the bright star Mirfak, northern hemisphere observers are reporting it again. The comet has faded to be sure, but though dimmer it is still visible as a fuzzy dot in the northern hemisphere. Southern hemisphere observers have a harder time of it, as the comet is much closer to the horizon, and you have to look through lots of murk. Last time I looked in binoculars, I couldn’t see it here in Adelaide, but the comet here is only three finger widths above the horizon (and directly above bright harbour lights from where I am). People more north than I am with darker skies should have better luck, with Queensland and the Northern Territory the best of all. A printable PDF map is here, the best time to see the comet is between 23:30 and 00:30 local daylight saving time. The comet is now to the west (left) of alpha Persii (Mirfak), and should be easy to locate in binoculars. The latest images show the comets coma is now significantly distorted, and no longer circular. A nice image is here, another here, a good animation is here. Australian images can be seen at IceInSpace. The 31st Carnival of Space is now up at Out of the Cradle. This issue has lots lunar goodness, space launches and great satellite imagery. Fire up the jet pack and head over now. If you would like to contribute a site for the next Carnival of Space, the instructions are here.